The Atlantic Road zigzags across low bridges that jut out over the sea, linking the islands between Molde and Kristiansund in the western fjords. 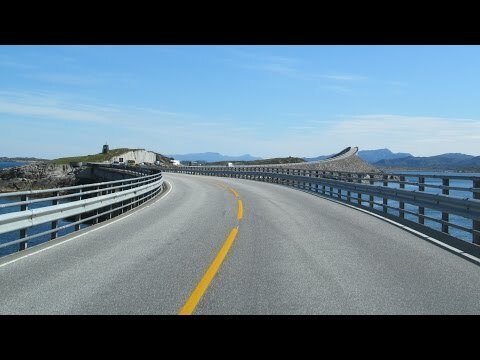 Was chosen as "Norway's construction of the century" in 2005, because of the road links and connecting small coastal communities, from the town of Kristiansund. The Atlantic Road is a 30-minute drive through the Atlantic Ocean Tunnel. After passing the tunnel you cross the island of Averøy with Kvernes Stave Church, the very beautiful west side of the island, and the incredible coastline out towards Hustadvika. You will find four panoramic view- and rest areas with facilities in bold architectural forms along the Atlantic Road. Here you can experience both nature and architecture in a significant interaction. Some of the viewing platforms are also popular with anglers. The Atlantic Road has been awarded the status national tourist route because of the architecture of the road and the bridges, and the incredible coastline it passes through.